Wapke Feenstra. 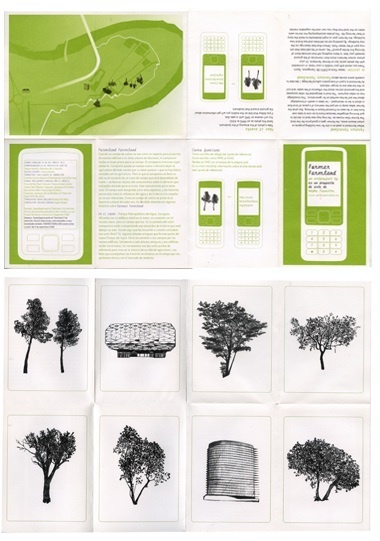 Former Farmland, Sagarossa, Spain, 2008; pamphlet/poster, 5.88 x 4.16 in. closed, 11.66 x 16.75 in. open. Landfill is a project that archives, studies, and redistributes the material byproducts produced by ephemeral artworks. It creates a second venue for projects that largely existed in non-material form, and aims to build a non-linear history of socially engaged art practice. Landfill exists in three parts: an online Archive, a material Quarterly, and a written Journal. The Quarterly is distributed to subscribers four times a year. 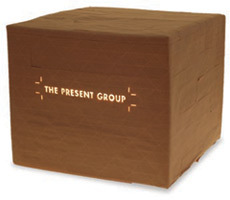 It contains the Journal and selected pieces of material ephemera. As part of the Landfill Archive, supplemental materials become conduits for ideas that continue to circulate. The Archive is an aggregate capable of accounting for the broad range of projects that self-consciously consider their publics, without laying claim to a singular narrative. It is accessible all the time, for free. They are looking for submissions. With this new addition, we now have 5 solid art subscriptions in the Bay Area! Check out the links on the sidebar to learn about them all. It’s pretty exciting to see how this model can adapt to suit all sorts of work and interests. It’s not clear if Landfill will use subscription dues solely to create the journal or if they will also be using some of the funds to compensate contributing artists who often rely on grants to accomplish this sort of work. My guess is for that price they will need most of the money just to accomplish the creation of the physical journal, shipping, and writing. However, as they grow, perhaps they will consider sponsoring projects to give back to the community of artists they will rely for donations.